And I have no preference between plain, sweet or savoury bread. A simple fresh baguette will make me just as happy as a chocolate bread or a cheese bread. 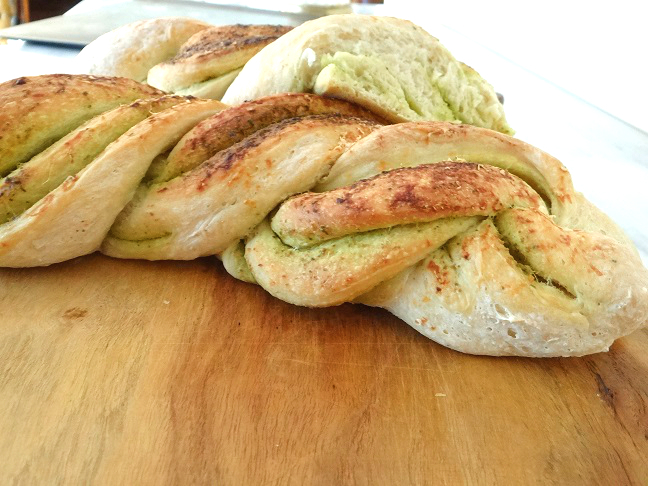 It has been a while since I baked some bread (my favourite, my far, being Isabelle’s no-knead bread) and somehow I had my sight set on a braided chocolate bread I baked a few months ago (basically Suzanne’s recipe, but with homemade Nutella) but I felt like having something savoury instead, and pesto sounded just like what I needed. For this recipe, I went with my basic, go-to bread dough, so feel free to use your own favourite or the one you’re most comfortable working with. Also, I used pesto from a jar, but by all means, if you know how to/can make your own, it’s obviously going to be so much better. In a food processor fitted with the dough hook attachment, add the flour, salt and yeast/starter. Make sure to put the salt and yeast on opposite sides of the bowl or the salt will kill the yeast. With mixer running on medium, slowly add your water. Mix until the dough comes together in a clean ball. Shape the dough into a smooth ball and transfer to a large, lightly greased bowl. Cover and allow to rise until doubled in size (30 minutes to 1h, depending on your yeast). Personally, I prefer making the dough by hand, as it allows more control over it. Remember that your skin has memory, and working with your hands will allow to get to know when your dough is ready (which a machine never will). While the dough is proving, prepare your pesto: put your basil and garlic in a blender and blitz until puréed. Add the cheese and pine nuts, blending quickly. With the lid on and your blender running on low, slowly drizzle in the olive oil. Roll out your dough on a silicone mat into a 25×50 cm/10×20 inch rectangle. Spread the pesto to about 1cm/½ inch from the edges. Tightly roll up your dough starting from one of the shorter sides (I started from a longer side because I like longer breads), pinching the edges as you go. Using a sharp knife, split the dough down the middle, leaving one end intact. Twist the ends around each other, making sure to turn the cut side towards the top. At this point, you can carefully transfer your dough to a lightly greased loaf pan, or go free-form as I did.Sprinkle with freshly grated Parmesan. Cover the dough with a towel and let rise for another 20-30 minutes. Bake for about 40 minutes or until you get that hollow sound when tapping the bottom.